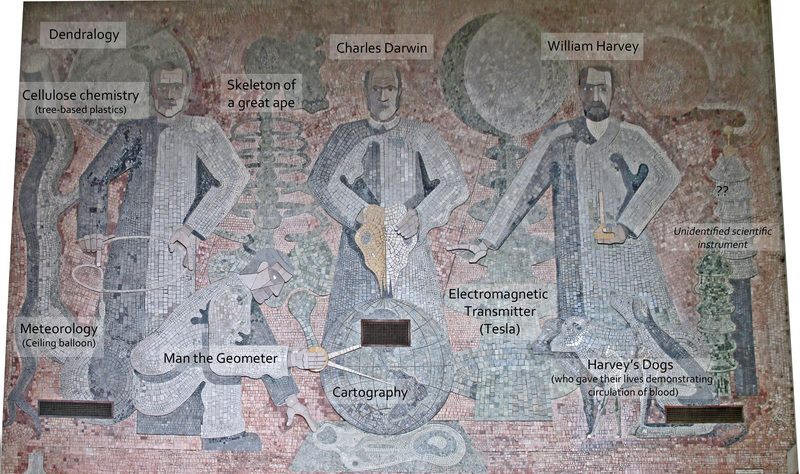 The mural in the North Portico is oriented to the organic sciences: biology, meteorology, geology, geography–the act of discovering and measuring. It features a young Charles Darwin at the center, holding one of the skulls that were so critical for his theory of evolution. On the right is William Harvey, 17th century English scientist who proved the circulation of blood, using dogs. The figure at the lower left is ‘Man the Geometer’ rather than the medieval idea of ‘God the geometer.’ The references are labeled on each image. Herman Volz, ‘Organic and Inorganic Science’ (upper North Portico). Photo illustration: Amy O’Hair. View larger. Herman Volz, ‘Organic and Inorganic Science’ (lower North Portico). Photo illustration: Amy O’Hair. View larger. 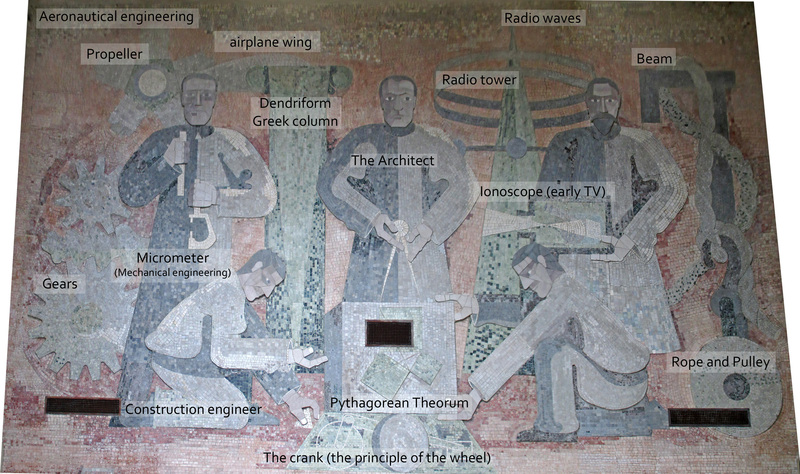 The mural in the South Portico is oriented to the inorganic sciences: construction, mechanics, aeronautics, and those principles that give rise to new practical inventions–the act of making. Herman Volz, ‘Organic and Inorganic Science’ (upper South Portico). Photo illustration: Amy O’Hair. View larger. Herman Volz, ‘Organic and Inorganic Science’ (lower South Portico). Photo illustration: Amy O’Hair. View larger.